Qigong is one of the many ways we have developed to study mind and consciousness and our relationships to the subtle world. Qi, also often spelled Chi, is a name for a spiritual energy which is a vehicle for communication of structure in physical and mental dimensions, encompassing both internal and external manifestations of influences such as healing. The concept arises in all cultures, but the focused idea of Qi is Chinese, and there are innumerable applications. Qi is central to a wonderful library of aphorisms and expressions of wisdom. Here is one. I thought that was a beautiful understanding, and decided to bring it to people who may look here for insights about Consciousness. Events led to others, and a few months later, when Garret and I met at the Science and Spirituality of Healing conference in Old Salem, he gave me a folder with three beautiful renditions of this thought. Yifang said that in speaking of Qi it is good to use positive forms, so she wrote for us the four characters: Focusing, Mind, Nourishing, and Qi, using the ancient calligraphic forms. 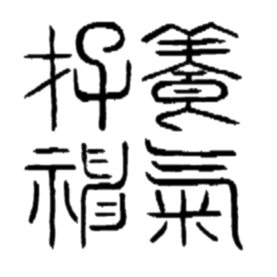 The expression above is a composite of the ideas in these characters. It means what Roger said, but much more. In a very general and positive sense it means that mind and qi go together, and have mutual roles of focus and support for each other. We profit from the integration.